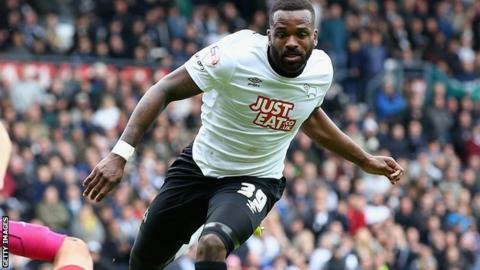 Derby County have signed former England striker Darren Bent and ex-Reading defender Alex Pearce on free transfers. Bent, 31, scored 12 goals in 17 appearances during a loan spell with the Rams last season and will become a Derby player when his Aston Villa deal runs out at the end of June. Republic of Ireland international centre-back Pearce, 26, has signed a three-year contract. The pair are the first new signings for new manager Paul Clement. Clement succeeded Steve McClaren as Derby boss on 1 June and has the final say on transfers, but the deals for Bent and Pearce were already close to being finalised before the former Real Madrid assistant boss was appointed. Clement said: "Darren Bent is a proven goalscorer. He is going to be key in our plans." Pearce played 51 times for Reading last season but, like Bent, was a free agent. "I have been at Reading since I was 12 years old," Pearce told the club website. "But there is always a time in your life when you have to move on with certain things and this is the time for me. "I need a fresh challenge and this with Derby is exactly what I'm looking for." McClaren was sacked last month after the club finished eighth in the Championship and missed out on a play-off place.